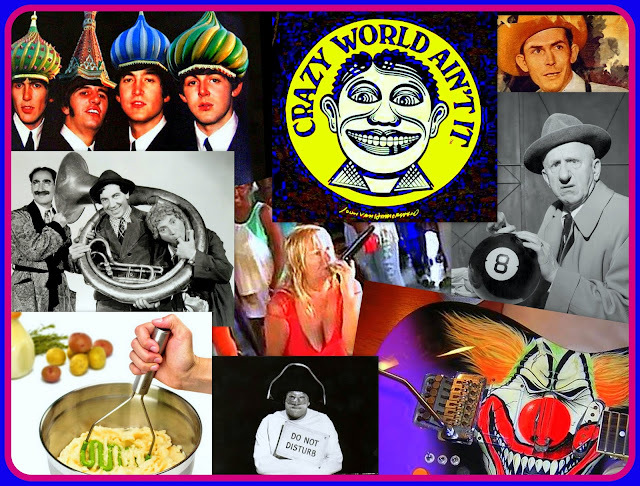 Stephen W. Terrell's (MUSIC) Web Log: WACKY WEDNESDAY: Another Year of Wacky! It's been two years since I started the Wacky Wednesday feature on this blog. Wacky Wednesday, was created "to introduce you, the reader to strange, funny and/or confounding music -- the type of "unclaimed melodies" that the Firesign Theatre's Don G. O'Vani was talking about when he said, `if you were to go into a record store and ask for them they would think you were crazy!' "
We've seen a lot of wackiness since Wednesday, Nov. 19, 2014. Last year about this time I did a Wacky Wednesday best-of. Guess what ... I'm doing it again. And we still had time for karaoke nightmares. Amanda, light of my life! Stay wacky, my friends. It may keep you from going crazy.